This line is closed. It was built and operated by Balfour Beatty and Co. Ltd during the construction of the Aluminium Works in Fort William. The line ran from a sea-pier at Loch Linnhe to the factory site (the lower works) and then on along the track of the pipeline (the upper works) which was constructed to being water from Loch Treig and Loch Laggan to the power station within the works. The line was later re-built by British Aluminium and used for maintenance of the upper and lower works. The original route of the line ran via "Base Camp" (where one of Balfour Beatty's works camps was based) it crossed both the main line of the West Highland Line and it's branch to Banavie (which was extended to Mallaig) on wooden tressle bridges. The line was re-routed via the bridge shown to the left. From Fort William to Loch Treig and Loch Linnhe. In Fort William the line served a Pier and the Aluminium Works. 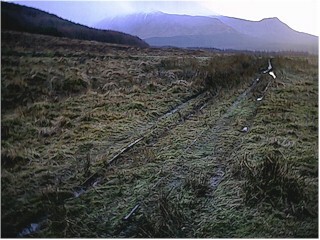 Trackbed, track still present, looking west to Fort William. Above Spean Bridge a short section of the line remains, although very overgrown and partly encroached on by peat. This was the site of a triangular junction for a speeder shed. The shed and triangular junction have gone. The section is bound by a level crossing with a dirt road to the west, and partly dismantled bridge to the east. The Lochaber Narrow Gauge Railway by Patrick Howat, ISBN 0-905489-43-8.